Over the past decade high performance boats have become much faster. The pace of development has been meteoric, particularly with the widespread uptake of hydrofoiling. While the popularity of the International Moth took off in the mid-noughties, it took the flying exploits of the AC72 catamarans in the 2013 America’s Cup to really capture the attention of the wider sailing world. 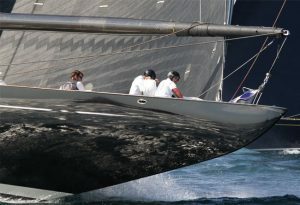 Since then the number of foiling craft has proliferated, from dinghies and small cats up to the likes of Wild Oats XI, which has also dabbled with foils at the Maxi level. Now foils have become de rigueur on the latest generation of Imoca 60s, and so it goes on. Breakage is an almost inevitable part of development. As legendary America’s Cup designer Ben Lexcen once said, ‘If it doesn’t break it’s too heavy.’ However, this trial and error approach doesn’t cut much ice with the insurance industry. Simon Tonks, deputy head of marine at Hiscox, has been insuring raceboats for more than 20 years. ‘At Hiscox we’re passionate about the sport of sailing and we love to support the latest developments,’ he says. ‘But with these increased speeds come increased risks, not only to the boats, but to the people sailing them and those in the vicinity. When you’ve got MOD70s and other kinds of high-performance boats flying around confined spaces like the Solent, these have safety – and insurance – implications.’ Read on.